It’s really not complicated to donate blood. 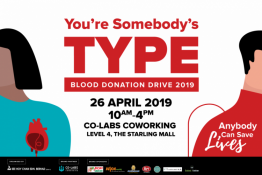 Registration, quick mini-physical and blood donation process only takes 30 minutes! For more information on this event, please email marcus@co-labs.asia). Blood Donation Drive 2019 is open from 10:00am till 4:00pm. This is event is open to the Public and completely free of charge. Complementary refreshments will be served.